This is part two of our series on ayzh—a company providing simplicity, dignity, and access when it comes to menstrual health for women and girls. Read how ayzh got started here. Happiness is not a word girls and women usually associate with getting their period every month. But, words like shame and infection should definitely not come to mind. For many around the world, this is their reality. Menstrual health education and support can become a crucial starting point in advancing better outcomes and lifelong health. Many girls and young women are unaware of the biology of menstruation and are ill-equipped to manage their monthly period. According to UNICEF, 71 percent of Indian girls do not know anything about menstruation before their first period. Girls and women also miss many days of school and work because they do not have access to proper menstrual products, or a private clean space to use or change them. In India, 89 percent use rags and cloth, 2 percent cotton wool, 7 percent sanitary pads, and 2 percent use ashes for the absorption of menstrual blood according to WaterAid. There is also always the constant danger of infection from the use of these unsanitary methods. In some communities, it is often much too expensive for families to purchase quality pads, so they live with embarrassment and humiliation due to leaking and staining, and further suffer under harmful superstitions and hurtful beliefs about menstruation that persist in many cultures worldwide. We want to bring simplicity, dignity, and access to girls and women when it comes to menstrual health. There is no one perfect period product for the more than 800 million women and girls who menstruate every single day. Across the world, a majority of women and girls – when given the choice – prefer ultra-thin disposable pads over other period products such as tampons, menstrual cups, and reusable cloth which are are often more difficult to buy, use, clean, and dry in low-resource settings where access to cash, water, and privacy is limited. There is dignity in having the knowledge and ability to take good care of our bodies, and those of our children. Girls need to be able to go to school and women to work using a product that will do the job. This can be achieved with well-designed and well-marketed products that become a familiar and trusted part of daily life, something that the developed world has long taken for granted. This is the way forward for ayzh, and for me, as I continue to broaden my vision and work to make it a reality. To responsibly meet increasing global demand for disposable sanitary pads, we have introduced kanya, our chlorine free, ultra-thin sanitary pad in India and just recently in the USA. We want to contribute to an ecosystem where sanitary products empower girls and women with the knowledge to manage their periods and can be disposed of responsibly and are good for the environment. 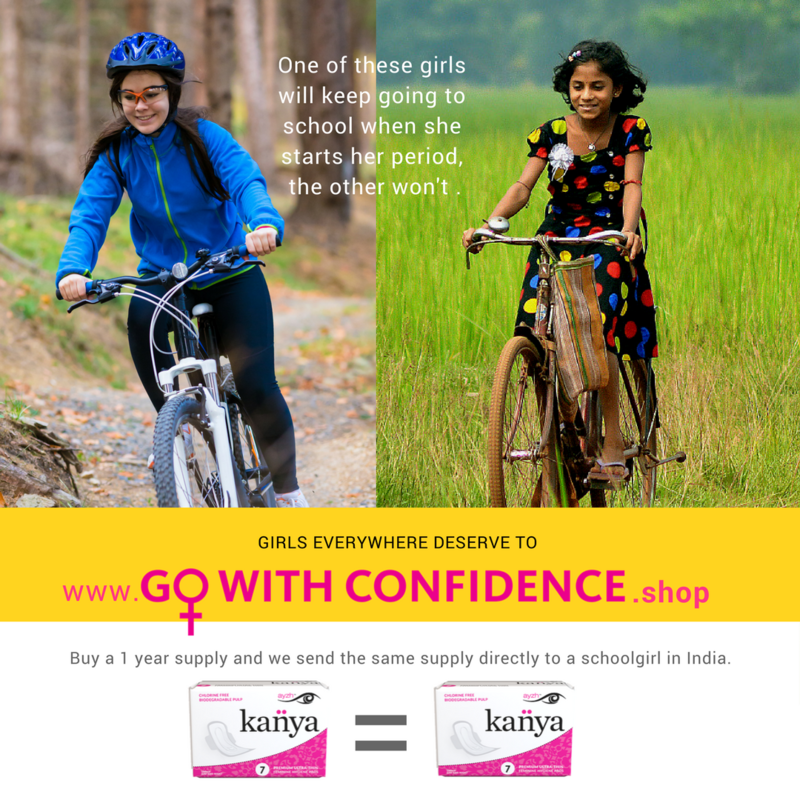 We have also launched our 1=1 Go With Confidence giving campaign. We aim to reach girls at their first menstruation with not only quality, affordable sanitary pads, but education about their bodies, about infection, and their entire reproductive cycle. Let’s empower girls and women everywhere. Until women of all ages understand the importance of health and hygiene, and seek and demand it across their life stages, there remains a huge missed opportunity for sustainable, intergenerational impact, and happier women, girls, and families. If from girlhood on a woman can get support and access to appropriate health care products and resources she can push through what has been for generations the obstacles to good health, to livelihood, and to the well-being of her family and community. We want her to go out into the world, and go with confidence.